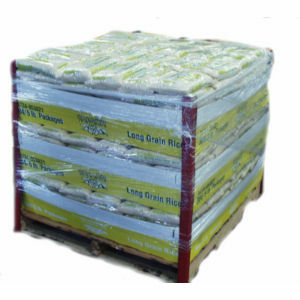 Faraon's most popular enriched long grain rice in a convenient pallet display! The pallet is ready to display simply by rolling from your dock to your display area. Assembled in three tiers, with a total of 384 bags of five pound rice, attractive packaging and shrink wrapped for protection. Simply break the shrink wrap when ready to display. This is a special order item. Please contact your sales representative well in advance of your requirements.